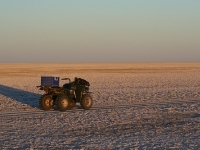 The Makgadikgadi Pans are located in the north-east of the country and are among the largest salt flats on earth, covering 6,200 square miles (16,000km²) of the Kalahari basin. During the annual rains, the pans become a source of fresh water and grass for migratory wildlife, especially the massive wildebeest and zebra herds that move through the area. Self-drive visitors are advised to use only four wheel drive vehicles as the terrain can be testing. A good map and a GPS system is also essential, as getting lost in the desert can be disastrous. Also, as a general rule, it is advised that visitors drive in the tracks of other vehicles and keep to the edge of the pan. Address: About 200 miles (322km) south-east of the Okavango Delta.